You need light once the sun goes down to perform even small tasks. Having a variety of portable lights can make your evenings much more enjoyable. Much like the “tiered” levels of our hydration system we also have a “tiered” system of light. The first tier is having an individual headlamp for each person. 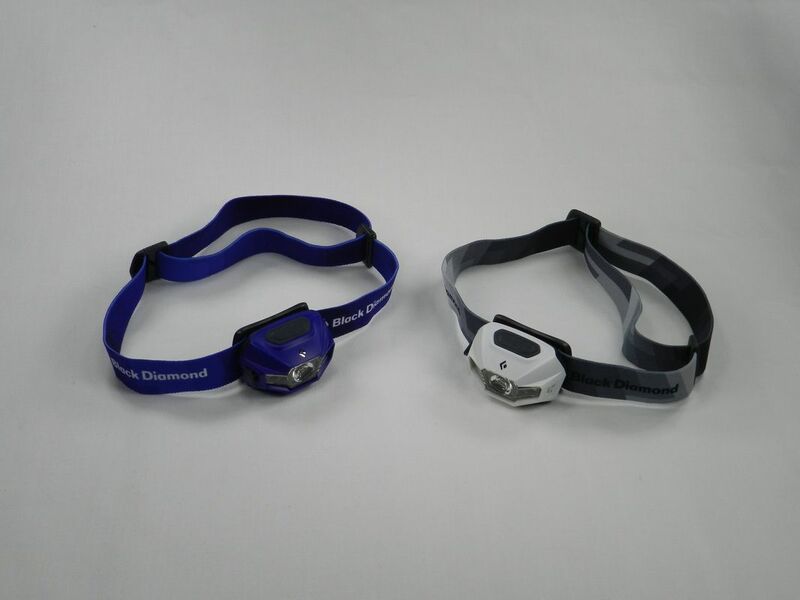 The criteria that we use to evaluate head lamps are: 1) maximum brightness, 2) distance, 3) point and broad coverage lights, 4) rechargeability, 5) white and red light, 6) adjustability of headband and 7) price. After examining countless options we selected the Black Diamond ReVolt headlamp. 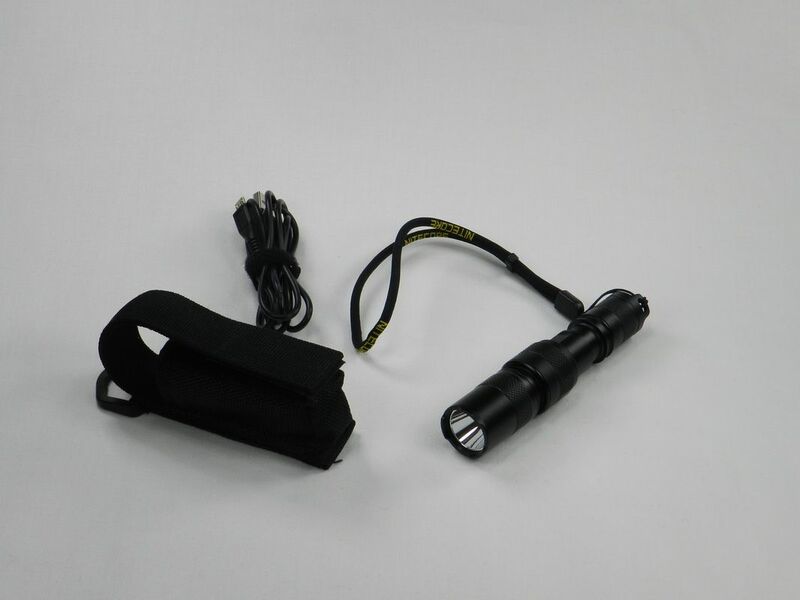 The headlamp has 1 Triple Power LED, 2 Single Power white LEDs and 2 Single Power red LEDs that emit up to 130 lumens. The controls on the headlamp allow you to easily transition between full strength in proximity and distance modes, dimming, strobe, red night-vision and lock mode. The Revolt can run on standard AAA batteries in addition to the included USB rechargeable batteries. We really like the face that we can either use AAA batteries or recharge it via a USB cable. That single feature has allowed us to use our headlamps much more freely since we don’t have to ration battery power in the backcountry. You can buy this headlamp at Amazon. Our second tier of light is having a light for the tent which allows us to take off our headlamps but still see what we are doing. The criteria that we use to evaluate tent lanterns are: 1) maximum brightness, 2) area covered, 3) ability to hang, 4) flexibility and 5) price. For inside our tent we use the Black Diamond Equipment Orbit Lantern/Flashlight. We really like that it can function both as a hanging tent light or as a handheld flashlight. The area light at the top is driven by 1 TriplePower LED with 105 lumens. The flashlight at the bottom of the lantern is driven by 3 DoublePower LEDs with 50 lumens and lights an area of 6 feet. Everything operates from one switch and the lantern also has a collapsible, double-hook hang loop that we use to support it in our tent. The lantern uses the 4 AAA alkaline batteries - so that makes it compatible with our headlamps. On low power the batteries should last about 70 hours. The lantern is 3.75” x 2” x 2” and weighs less than 4 oz. You can buy this lantern at Amazon. Our third tier of light is a small area lantern that we use outside of the tent to allow us to work in the immediate area. 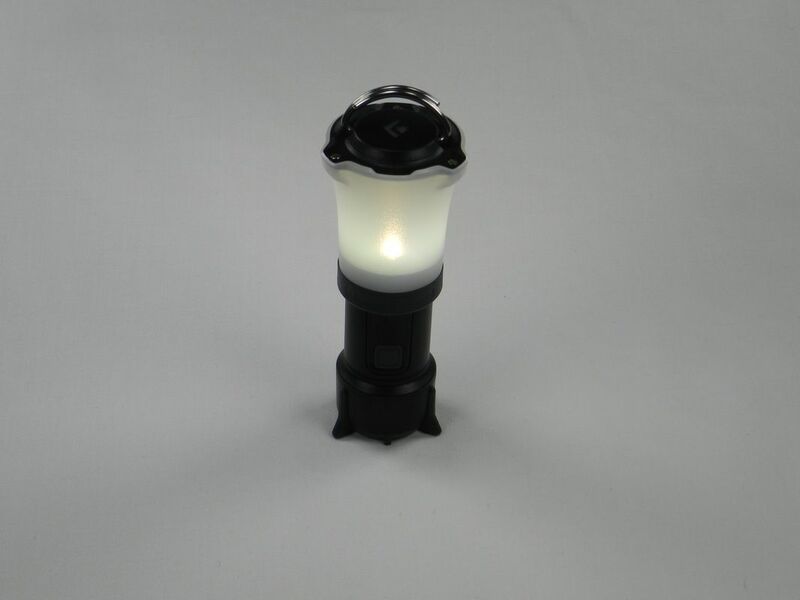 The criteria that we use to evaluate area lanterns are: 1) maximum brightness, 2) distance and 3) price. For this tier we use the Black Diamond Equipment Apollo Lantern, and actually have both an older model (80 lumens) and the latest model (200 lumens). We love these lights. They have a great set of fold-down legs that increase the lantern's height and maximize its light dispersion. 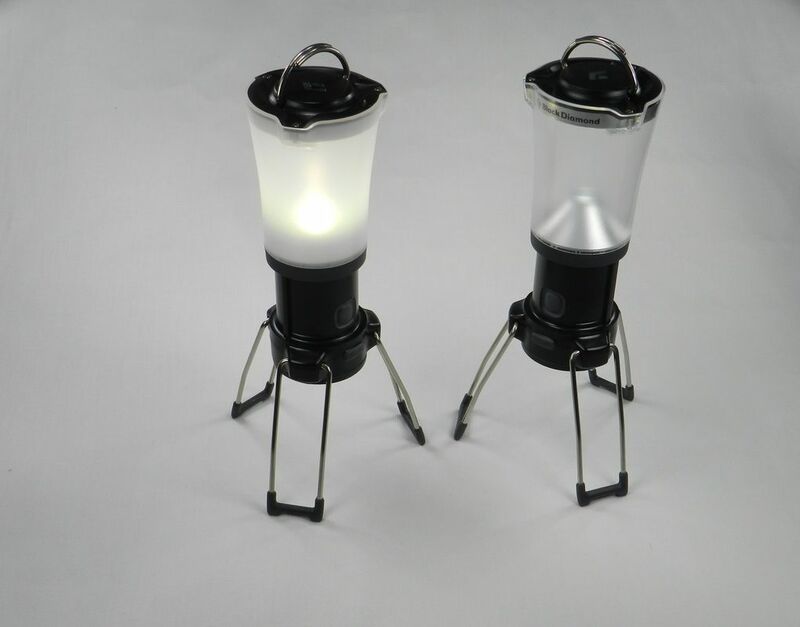 The 200 lumen lantern throws light out to 50 feet. They have collapsible, double-hook hang loop so that we can elevate them on a paracord line. They can be dimmed to provide adjustable brightness. Both lanterns are approximately 5” x 3” x 3” and weigh less than 8 oz. They run off of 4 AA batteries which provide an average life of 90 hours. You can buy this lantern at Amazon. The fourth, and final, tier of our lighting plan is having an individual flashlight for each person. The criteria that we use to evaluate flashlights are: 1) maximum brightness, 2) distance, 3) rechargeability, and 4) price. Since we sometimes need a bright light in the woods we purchased NiteCore Upgraded MH1A Multitask Hybrid Rechargeable Flashlights for this tier. This flashlight puts out 600 lumens, is made from HAIII military grade hard-anodized aluminum alloy, with a lens of ultra-clear mineral glass with anti-reflective coating that makes it waterproof in accordance with IPX-8 (submersible to two meters). The flashlight runs on a Nitecore 14500 Li-ion battery (NL147) that provides a maximum runtime of up to 23 hours and, like our headlamp, it is USB rechargeable. Something that we love in the backcountry. You can buy this flashlight at Amazon. When we are out in the backcountry sometimes we want to mark a location or an object so that we can find it at night. 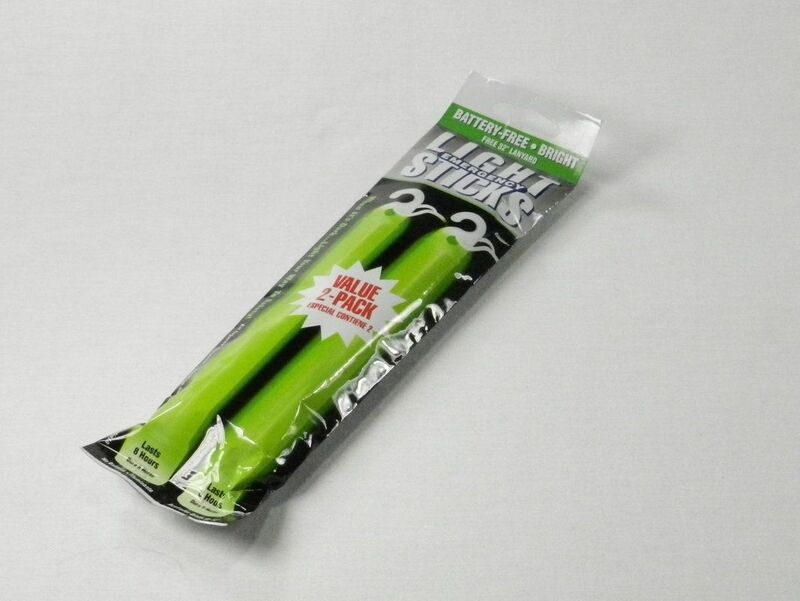 For this purpose, we have found that emergency light sticks provide a great solution. The criteria that we use to evaluate light sticks are: 1) maximum brightness, 2) light duration, 3) shelf life, 4) compactness and 5) price. Based on using several light sticks we like the Ready America (a company specializing in emergency preparedness) light sticks. They can be hung up at a location or attached to an object (two 32” lanyards are included), last for up to 8 hours, are cool to the touch, don’t require any batteries or external power, can be easily stored in their sealed foil bag and have a 4-year non-toxic shelf life. You can buy these Light Sticks at Amazon.